Blocked Drains? Richardson Clogged Drain Clearing. If you have a blocked drain, Richardson Plumbing Pro can help you with the right diagnostic equipment and the full range of drain clearing solutions. Your blockage can be cleared, from the smallest clogged sink, to an obstructed sewer line. 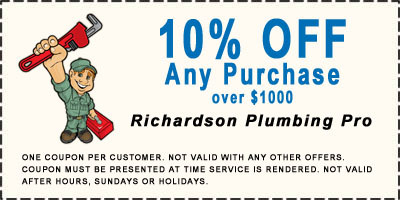 Best of all, you can benefit from the Richardson Plumbing Pro standard of service and dedication to customer satisfaction. Burst or Leaking Pipes? Richardson Leak Repair Today. If you have a broken or leaking pipe and can't turn the water off, call immediately. Water can do serious damage to your home and your property. We can have a Richardson plumber dispatched and on his way to you for emergency repairs. If you've managed to turn the water off, or it is only a minor leak - we can book a repair around your busy schedule at a time convenient for you, all with the Richardson Plumbing Pro service you can trust. Slab leak detection is just one of the professional Richardson plumbing services that we offer. Our expert plumbers are highly skilled and trained in the art of leak detection. We employ all of the latest leak detection equipment in the industry. This is why you can find the best leak detection in the Dallas area with us. We offer complete plumbing leak detection and location services as part of our wide range of plumbing services. Using high-tech equipment, our technicians are able to pinpoint with accuracy the source of the leak. No matter if it is behind a wall or under a concrete slab, leak detection equipment will quickly find the problem by using a high-frequency location device to zero in on tiny pressure differences within the pipes. We specialize in repair and restoration of older homes! It's also important to address plumbing repair when putting your home on the market. You can trust that our professionals have the experience you need. It is our goal to provide state-of-the-art service with the best equipment available, to be on time, and to make sure that our work is performed correctly the first time. Trust Earned the Old Fashion Way! Call us today at 972-546-2974. There are more than 10 different types of common end-user plumbed-in fixtures. Some include: toilets, urinals, drinking fountains, sinks, bathtubs, showers, ice makers, humidifiers, faucets, eye wash stations, washers, dishwashers, and fountains. What do they have in common? They are all connected to pipes and drains. If any of these fixtures are causing you problems, call Richardson Plumbing Pro today. Unless you are spending endless hours in the shower or constantly watering your plants, chances are you have leaking pipes. Many leaks are easy to spot such as a dripping faucet or water spots on the floor or ceiling. Others can be very difficult to locate and you will need assistance in order to find the source of the leak. In either case, you are spending unnecessary money for unused water and/or repairing unnecessary water damage to various aspects of your home. 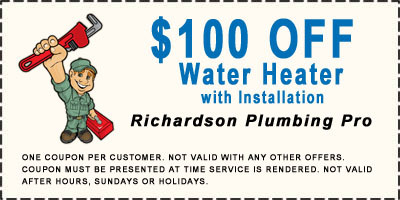 Contact your Richardson plumber if you think your water bills are too high. 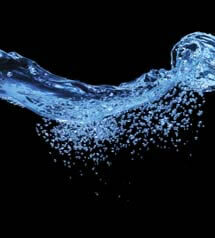 A leaky faucet can waste 20 gallons a day. A leaky toilet can waste 30 gallons a day. A low flush toilet could save 40.5 gallons a day versus a 10 year old toilet. Pour hot water down the drain to break up grease buildups. There could be some object in the drain.Remove and thoroughly clean the sink pop-up stopper or strainer. Determine if the clog is close to the sink by checking the other drains in your home. If more than one won't clear, you likely have a main line stoppage. Main sewage line clogs can be cleared through clean-outs (via a drain snake) or if clean-outs are not available, through the vent stacks on top of the roof. Need help? 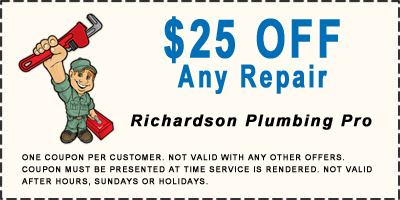 Call us, the Richardson plumbing experts at 972-546-2974, for immediate assistance. Now is the time to check the water shut off valves in your home. These preventative maintenance steps should be done on each fixture like toilets and sinks to ensure proper operation. Also, don’t forget to locate and test your whole house shut off valve. This could be one of the most important items in your house, especially if you have a burst pipe. Every water-using fixture in your home or office that drains into the sewer system has a trap. The trap is designed to separate your home from the sewer. This separation is accomplished by leaving a small amount of water trapped in the pipe. 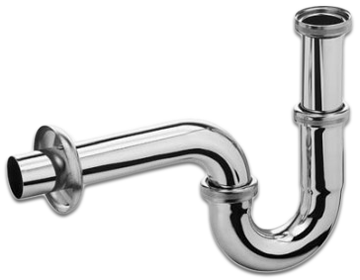 The P-trap is one of the most common problem areas of any Richardson plumbing system. By its nature, the trap will collect hair and debris causing it to slow down or even leak. In many cases, the P-trap can be repaired by a handy homeowner, however, if this is a job you just do not want to tackle, give your professional Richardson plumber a call today. 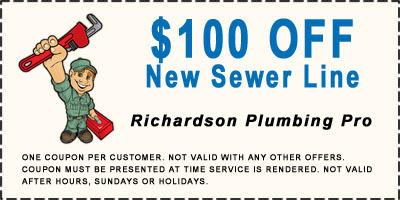 One of the most important, yet overlooked, parts of our Richardson plumbing is the drain vent system. Those small pipes that extend through your roof are the actual vents. If the vents get blocked, you often can get symptoms of a clogged or slow drain. If you hear unusual gurgling or a toilet that has the water pulled from the bowl then there may be issues with the vent system.